Each month, Women Gather organizes a new volunteer opportunity with an incredible non-profit in Los Angeles. Connect with a cause you believe in by checking out our upcoming events. Did you know that your gently-used bras can be used for good? Instead of trashing bras that you don’t wear but are still in good condition, donate them! From February 1st - February 23rd, Women Gather is hosting a Bra Drive to benefit women and girls in need! All donations will be given to I Support The Girls! I Support the Girls collects and distributes donations of new and gently used bras, and individually sealed tampons and maxi pads to women and girls nationally and internationally. Whether they be homeless, refugees, in transitional housing, or fleeing domestic violence, women and girls should never have to compromise on dignity. There are several ways that you can donate and support the cause! Attend our Brunch & Bra Drive event on Sat 2/23 at Cruzita’s Deli & Cafe. We’ll be there from 10 am - 12 pm enjoying brunch, so feel free to drop off donations, help us sort through collected items, and enjoy delicious food! Our January volunteer opportunity is with The Compton Initiative! Join thousands of volunteers as we paint, clean and heal homes, schools, and street blocks in Compton. The event begins at 7:00am sharp, so please arrive in the clothes you plan to wear while cleaning and painting. Worksites will be assigned after you check-in. Breakfast will be provided and pizza will be served for lunch. Parking is free and there is no cost to participate, but donations are welcome on their website in the form of credit card or on event day in the form of cash. We are going to have lots of fun while making a difference, so please spread the word and invite your friends to join! Let Us Know If You’re Joining Us! Thank you for signing up to volunteer with Women Gather on January 26th. If you are no longer able to attend, please email womengatherla@gmail.com. See you soon! We have an amazing opportunity this holiday season to give back to some children at the Union Rescue Mission on Skid Row in downtown Los Angeles. On Saturday, December 29th we'll be hosting a fun New Years themed holiday session for 2-5 year olds at URM. This is a time for us to host special games, activities, crafts, and snacks in order to spread holiday joy to kids living at the mission. They are expecting 40 kids to come to our session, so we need all the help we can get! The leadership team is planning the schedule for our session, but all ideas are welcome! Thank you for signing up to volunteer at the Union Rescue Mission on 12/29. If you need to change your RSVP, please email womengatherla@gmail.com. It's Dia de los Muertos season at Self Help Graphics & Art and that means it's time for their Community Art Workshops! Every year, SHG hosts workshops and other events leading up to their main Dia de los Muertos Celebration on November 2nd. This will be our third year volunteering with Self Help Graphics & Art and it is one of our FAVORITE events!! Community Art Workshops offer hands-on activities and instruction in flores de papel (paper flowers), papel picado, and mask making, as well as the life-size, papier mache Calaveras customary to our main Dia de los Muertos Celebration. The calaveras and other works created are always an indispensable part of our décor for the big celebration, and our artist instructors need assistance in order to make these workshops enjoyable for everyone involved. Volunteer positions include set up, artist instructor assistance, and break down. We will be volunteering on Saturday, October 20th during Shift 1 starting at 10 am. **To attend this event, you must sign up directly with SHG here. Thank you for signing up to volunteer with Women Gather on October 20th at 10 am. If you need to cancel, please email womengatherla@gmail.com See you soon! For our September volunteer event, we're back for the 2018 Community Cup with EngAGE! We had SO much fun at last year's event and are excited to participate again! Minimum age requirement is 8 and lunch will be served. Members of the EngAGE community will be participating in a multitude of events, performances, and arts and crafts competitions. Emphasizing EngAGE’s mission of encouraging an active and healthy lifestyle, the EngAGE Community Cup treats the participants to a day of spirited competition, great food, and quality entertainment at absolutely no cost, including free transportation. Many participants delightedly return home with medals and prizes for their efforts, and the community with the most points in the athletic competitions takes home the Community Cup trophy. All volunteers will receive a free t-shirt to weart at the event! Thank you for signing up to volunteer! If you need to cancel, please email womengatherla@gmail.com. See you on September 15th! Come support Women Gather member Dr. Aldene Zeno and Medicine for Humanity with a special fitness fundraiser at the grand opening of Crossfit 1440/Lomita Athletics on Saturday, August 25th. ALL proceeds raised will go towards helping women in need of surgery in Uganda! Join us for a morning full of fitness, fundraising, and fun! In September, Aldene is traveling to Uganda with other UCLA surgeons to assist Medicine for Humanity. This organization provides much-needed surgeries to help women who have injuries from childbirth called obstetrical fistulas. Without this surgery, many women face infections, limited abilities, and a lifetime of complications. With your help, we can support this important cause! 12 pm -1 pm: Raffles, a live auction, and fun! This a FREE event, however a $5 donation gets you a raffle ticket and covers a day of meals for a woman in Uganda after her surgery. $1 gets you additional raffle tickets. Can't make it to the event? DONATE HERE. Make sure to put "Aldene Zeno" in the comments. We're so excited to be volunteering with #HashtagLunchBagLA for our June event! We'll be assembling bagged lunches for those in need in a fun and family-friendly atmosphere. Children are welcome! Packing lunches is from 10 am-12 pm and you can also choose to participate in the distribution from 12 pm-1 pm. A $10 donation is suggested for all volunteers. "Gather your friends, family and colleagues to help us spread love one lunch bag at a time. It's a true party with a purpose and we would love to see you there. Donations of $10 per volunteer are highly encouraged. In the spirit of giving more? Your donations will help support our entire organization. The #HashtagLunchbag experience consists of bringing together a group, creating bagged lunches, dropping in a handwritten love note acknowledging the recipient, distributing the meals to your local community, and sharing your experiences with your friends & followers, inspiring them to pay it forward - turning one ripple of kindness into a wave, one lunch bag at a time!" Thank you for signing up to volunteer with us. If you need to cancel your RSVP, please email womengatherla@gmail.com. Women Gather is excited to be volunteering at this fun event by passing out water and cheering on participants. Please help us support such a great cause! Children of all ages are welcome to join! NEW’s mission is to build economic mobility for the community, including Latinas and their families, through wealth creation, housing, education, entrepreneurship, and civic engagement. Thank you for signing up to volunteer with Women Gather at the Moms Helping Moms Run 5K. If you need to change your RSVP, please email womengatherla@gmail.com. Join Women Gather as we come together with Friends of the LA River for the 2018 Great LA River CleanUp! This is a family friendly event for parents and children 8 years and up! We're SO excited to be volunteering once again with The Princess Project LA at the Violence Intervention Program! The Princess Project has made prom a reality for more than 20,000 teens who could not otherwise afford to attend. This year, The Princess Project has once again partnered with the Violence Intervention Program for a dress and tuxedo giveaway for the teens in their program. This year, the Princess Project opened up the giveaway to VIP clients AND to 25 local high schools! It will be fun, fast paced and AHH-mazing. We are so excited - this year is going to be HUGE. This was one of our favorite events from last year and we can't wait to go back! Sorry, but no one under the age of 18 is permitted to volunteer at this event. Thank you for signing up to join Women Gather in volunteering with The Princess Project! If you have any questions or can't make it to the event, please email womengatherla@gmail.com. Do your kids have more toys than they need, especially after the holidays? Have you been looking for a way to teach your kids the importance of giving back? Join us as we partner with Good SamariTots to host a toy drive to benefit the Los Angeles County Department of Social Services's Toy Loan program. You and your child can bring their previously loved toys to the Good SamariTots meetup on January 22nd and it will be donated to the Toy Loan program which serves over 30,000 children a year! Any used toys just need to be working and have all the parts. New toys will also be accepted. 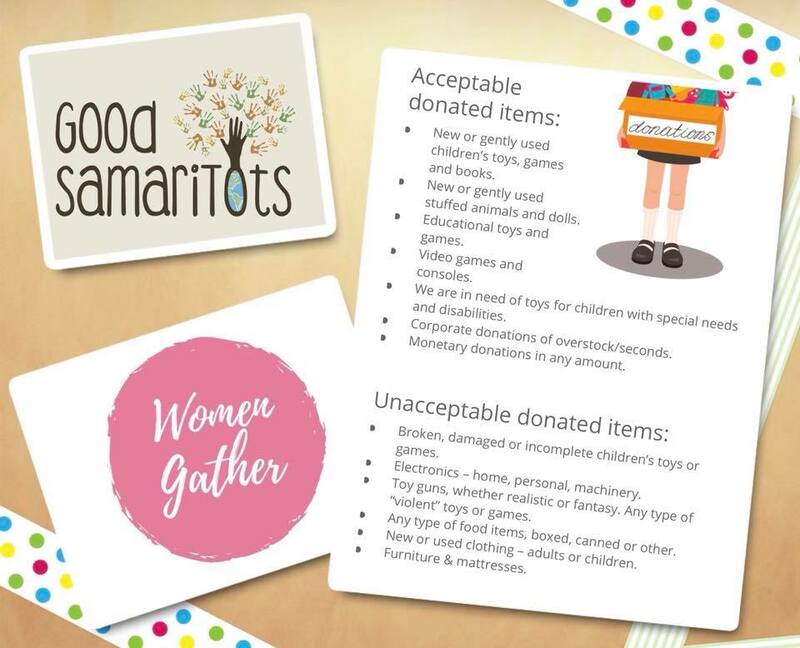 Additionally, Good SamariTots is celebrating their 1st birthday by packing Birthday Boxes for local foster children and Women Gather attendees will be able to join in on the fun! This event is specially designed for young children to participate, although all are welcome! Please RSVP using the form below to let us know you're coming! Yes, I will be attending! Thank you for RSVPing to the Toy Drive with Good SamariTots on January 22, 2018 from 3-4:30 pm. Please remember to bring a new or gently used toy to this event. If you have any questions or need to change your RSVP, please email womengatherla@gmail.com.